If you are looking for an online retailer to buy Gold bars or Silver coins, you may be overwhelmed by the sheer number of options available. Instead of scouring the internet or picking a store randomly, why not go with the industry leader that thousands have trusted to buy bullion Gold and Silver? Or the company with some of the most exciting collectible coin sets available online? In both of those cases, the answer is the same: APMEX.com. When you look at the thousands of customer testimonials you can see a common five reasons why they’re buying from APMEX. So, what makes APMEX stand out from the crowd? Consider the following. We carry an incredible selection of Gold bars, Silver coins and other well-known Precious Metals collectibles purchases directly from mints all over the world. We also have one of the largest selections of Palladium products anywhere. Our selection is almost overwhelmingly large — luckily, our website search feature makes it easy to find exactly what you need. One of the things APMEX customers mention most often is that they appreciate our vast knowledge of the Precious Metals industry as a whole. We have a team of industry experts who bring their years of experience together and share it with our team and customers. We go beyond just knowing our own product lines; our team will do what it takes to answer your questions! We know purchasing investments isn’t a decision you make lightly and we’ll do what it takes to inform you so you’re comfortable with the decision your making. Excellent customer service is the key to our success. We go the extra mile to make sure all our customers are 100 percent satisfied with their purchases and their buying experience as a whole. For example, we fulfill all of our orders ourselves to serve our customers better. If something doesn’t go as planned we can fix it quickly and without hassle to the consumer. We pride ourselves on our concierge level of customer service and we know it’s appreciated, since the majority of our customers come from referrals. We’ve been in business for over 11 years and we know that when you buy Silver, Gold or other Precious Metals, you not only trust that we will deliver what you order, but you trust us with your information. We use top-of-the-line security standards and ship your purchase in secure, unmarked packages to reduce the possibility of theft. APMEX wants to make your Gold and Silver purchase as convenient as possible. You can shop online 24/7 or call our customer service representatives at 800.375.9006 from 8am – 6pm to place your order or with questions. We have product and price alerts as well as our asset allocation tool which shows your Precious Metals holdings and their current value. When you order, we will process your purchase to get the product in your hands quickly, carefully, and securely. As you can see, there is a lot to appreciate about APMEX’s products and service. When you place your first order, you’ll find these five reasons are only the beginning. Call or contact us today and find out firsthand why we are your best resource for everything related to Precious Metals. We can’t wait to serve you! 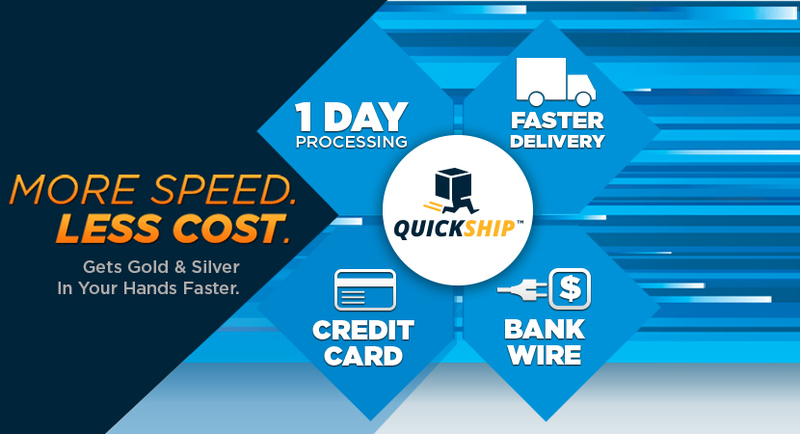 How does APMEX ship products so fast? We maintain over $60M in inventory at all times as well as have a state of the art fulfillment operation. This enables us to ship faster. Because we always try and exceed expectations, more than 1/3 of these orders even shipped same day! At APMEX, customers always come first. Even if that means that we have to work overnight, during the weekend or right through the holidays. In fact, our shipping team worked over the weekend and all Silver American Eagle pre-orders shipped on Saturday or yesterday! Thank you for shopping on www.APMEX.com and we look forward to helping you meet your investment goals this year by getting Gold and Silver in your hands faster. Gold Maple Leafs Only $34.99 Per Coin Over Spot – Only Until Midnight Wednesday! Canadian Gold Maple Leaf coins, considered some of the most beautiful Gold coins in the world, appeal to both investors and collectors worldwide for their beauty and high purity. Reverse: A large, single maple leaf with a small maple leaf privy mark that has a micro-engraved “13” in the center, visible under magnification. The “13” will change annually to correspond with the year of issue. Today Only – Carnival of Savings Features Stars & Stripes Silver Rounds 99¢ Over Spot! Our Carnival Of Savings continues with something for everyone — more than 1,800 incredible Gold, Silver and Platinum values. Shop now! Quantities are limited and the APMEX Summer Carnival Of Savings leaves town Friday July 19, at Midnight (ET)!